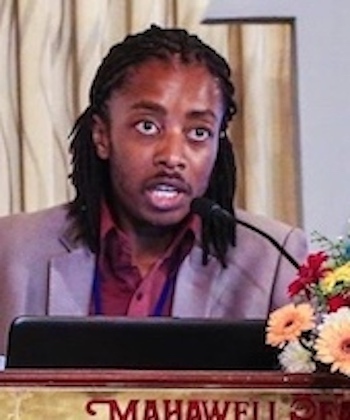 Summary:Tunamirai Zimonte is a founding member and director of Youth and Alcoholism and Drug Dependency—YADD—a nonprofit dedicated to educating young people in Zimbabwe on the dangers of alcohol and drug abuse. Both have become increasing problems in Zimbabwe, particularly for youth. Not only does Zimonte speak and write about these problems, but he also facilitates training workshops and lobbies the government for enforcement of drug laws. He is continually threatened by drug dealers, and police are typically reluctant to take any action. Nonetheless, Zimonte perseveres in trying to save young lives. Profile:Three million. That’s the number of people in Zimbabwe who are suffering from alcoholism. And the number will probably rise: A paper entitled “Drug Use, Abuse and Alcoholism in Zimbabwe” predicted that by 2022, alcoholism will be Zimbabwe’s number-one social problem. A significant proportion of the victims of alcoholism in Zimbabwe are youth. There are laws regarding selling alcoholic drinks to minors—those under 18—but few people abide by them. Virtually anyone can buy, sell, or use alcohol. And the results are clear: Young people lying alongside roads and sidewalks, having overdosed on alcohol or other drugs, are increasingly common sights. Stories abound of teenagers hosting house parties—devoid of adults—at which everyone gets drunk, of authorities turning away from these infractions so as not to exacerbate a populace already frustrated by economic hardship, and of drunken drivers running down pedestrians. Tafadzwa Goliati of the Passengers Association of Zimbabwe, can attest to the latter: “Passengers’ lives are being put at risk by some of the drivers who are in the habit of consuming the illicit spirits before driving.” And studies show that over 1,000 people in Zimbabwe die in alcohol-related accidents each year. Zimonte has conducted training workshops, brought together young people to share their experiences, and lobbied to change and enforce laws against drug use, particularly for minors. He continually points out not only the short-term effects of drug use but also the longer-term effects, including promiscuity, violent crime, and sexually transmitted diseases. As you might expect, Zimonte is not popular with some groups, for example, drug dealers. In particular, when he is conducting awareness campaigns in urban areas, they inevitably let him know that his continued existence on this earth is precarious. Nonetheless, he is not intimidated.